Welcome to Music Friday when we bring you awesome songs with jewelry, gemstones or precious metals in the title or lyrics. Today, New York City dance-pop band Cobra Starship gives a nod to the Beatles in its 2009 release, "Living in the Sky With Diamonds." In this disco-influenced song about a high-living lady obsessed with the club scene, Cobra Starship's lead vocalist Gabe Saporta describes a night of non-stop dancing. He sings, "She's dancing with the stars / Living in the sky with diamonds / She's dancing with the stars / And oh, how the lights are shining." "Living in the Sky With Diamonds" pays homage to the Beatles' 1967 hit "Lucy in the Sky with Diamonds." Written by John Lennon, the psychedelic song was inspired by the nursery school drawing of his first son, Julian, who was four years old at the time. The young Lennon reportedly titled the drawing "Lucy—in the sky with diamonds." After the song's release, many Beatles fans believed the title of the song actually stood for LSD, a potent hallucinogenic drug. Lennon and other members of the Beatles consistently denied the connection. The references to famous tunes of yesteryear don't end there. Cobra Starship's song also borrows the hook — "And oh, oh here she comes" — from Hall & Oates' 1982 hit "Maneater." Cobra Starship's "Living in the Sky With Diamonds" was the third single released from Hot Mess, the band's third studio album. Hot Mess made its debut in August of 2009 at #4 on the Billboard 200 albums chart. USA Today's Edna Gundersen called the album "deliciously fun and kitschy" while MTV's James Montgomery said Hot Mess was Cobra Starship's "most brilliant album." Founded by Saporta in New York City in 2006, Cobra Starship was known for its goofy, fun, sarcastic music. During its 10-year run, the band produced four albums and two Billboard Hot 100 Top 10 singles. Band members included Saporta, Ryland Blackinton (guitar, backing vocals and synthesizer), Alex Suarez (bass and backing vocals), Nate Navarro (drums) and Victoria Asher (keytar and backing vocals). The group officially announced its disbandment in November of 2015. "Living in the Sky With Diamonds"
Written by S. Allen, Mike Caren, Ollie Goldstein, Darryl Hall, Philip Lawrence, Bruno Mars, John Oates and Gabe Saporta. Performed by Cobra Starship. And the room is heating up. But she still can't get enough. And oh, oh here she comes. And oh, how the lights are shining. Cause you know you think it's hot. But she don't know when to stop. You're the talk of the town. And I hope you come back down. And I hope you come down. Described as "impossibly rare" and "a complete fluke of nature," the 2.83-carat "Argyle Violet" diamond will go on public display next month as part of the “Diamonds: Rare Brilliance” exhibition at the Natural History Museum of Los Angeles County. New York-based L.J. West Diamonds placed the winning bid for the headliner of Rio Tinto's “Chroma Collection," a select grouping of 63 rare pink, red and violet diamonds from its Argyle mine in Western Australia. Each year, the mining company cherry-picks the best of the best to be offered at its annual tender. Although the winning bid was not disclosed, experts estimated that the oval-cut Argyle Violet would fetch between $1 million and $2 million per carat, yielding a final price of $2.8 million to $5.6 million. The principals of L.J. West were excited to share the amazing diamond with the public. The Rio Tinto-owned Argyle mine generates more than 90% of the world’s pink diamonds, and on rare occasion will yield a violet stone. In the past 32 years, Argyle has produced only 12 carats of polished violet diamonds for its annual tender. In fact, before the discovery of the Argyle Violet, the mine had delivered just one other 1-carat-plus violet-colored diamond — and that was in 2008. When Rio Tinto first revealed the unusual diamond back in May, company representatives could barely contain their excitement. "A complete fluke of nature,” is how Josephine Archer from Argyle Pink Diamonds described the Argyle Violet to Yahoo7 News. The Argyle Violet is the largest violet diamond ever recovered from the Argyle mine in Western Australia. Argyle’s master polisher Richard How Kim Kam worked for more than 80 hours cutting the 9.17-carat oddly-shaped rough diamond into its perfectly symmetrical final form. More than 69% of the diamond’s weight was lost during the cutting process. 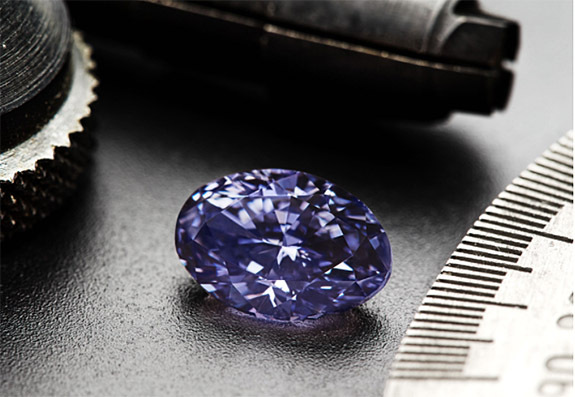 The Argyle Violet was assessed a color grade of “Fancy Deep Greyish Bluish Violet” by the Gemological Institute of America. 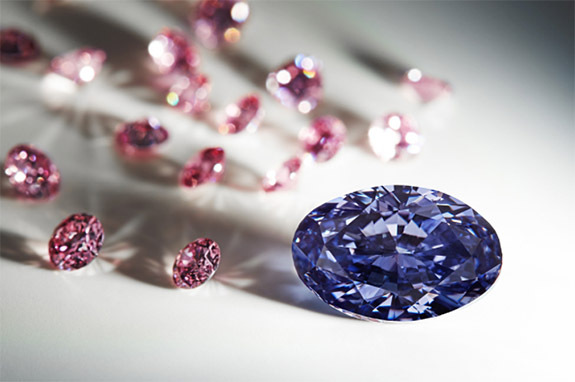 Violet diamonds owe their unique color to the presence of hydrogen atoms in the chemical composition of the stone. The “Diamonds: Rare Brilliance” exhibition is schedule to run through March 2017. After that, the gem will be sold — not via the high-profile auction channels — but through L.J. West's retail partners. Richard Wise's Secrets of the Gem Trade: The Connoisseur’s Guide to Precious Gemstones became a bestseller when it was first published in 2003. Over the past 13 years, the author has seen so many new twists and turns in the marketplace that he was inspired to make his authoritative book even better. The newly released second edition includes 11 new chapters, five new introductory essays and 161 additional images. By revealing how the world's best gemologists evaluate precious gems, Wise aims to give the reader the power to differentiate between a "good stone" and a "truly fabulous museum-quality gem." Gem enthusiasts will see new chapters about jadeite, demantoid garnet, natural nacreous pearls, conch pearls, Golconda (Type IIa) diamonds, sunstone, peridot, moonstone, cobalt blue spinel, red/pink spinel and violet diamonds. The publisher noted that the two new chapters on pearls address a huge resurgence in natural pearls. The inscrutable jade is discussed in clear terms that both Asian and Western readers will understand. And in his new introduction, Wise tells the story of the Blue Whites, the crème de la crème of colorless diamonds. The 404-page visual delight includes exclusive images from two major museum collections and an array of the latest auction head turners. The images are individually spot varnished for color depth and accuracy. The book is divided into two parts. The first examines the term "preciousness," as Wise leads the reader to a better understand of the criteria that define a gemstone. 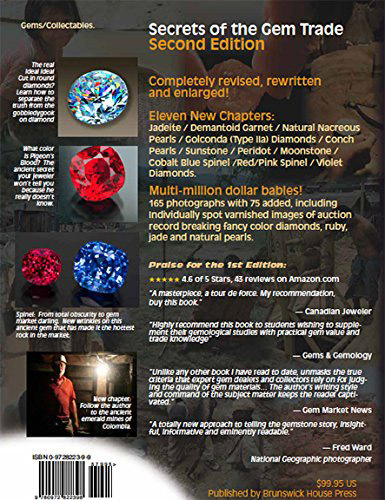 The second part contains a series of essays that delve deeply into the unique qualities and characteristics of what the author describes as 35 of "the most beautiful and the most important gemstones available today." These include diamond, pearl, tourmaline, sapphire, chalcedony, spinel, ruby and garnet. 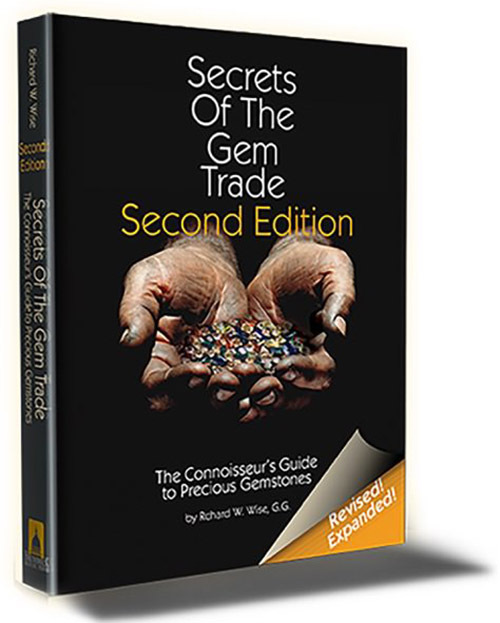 Secrets of the Gem Trade has a cover price of $99.95 and is available at Amazon, Barnes & Noble and most other major book retailers. Credits: Images by Brunswick House Press. 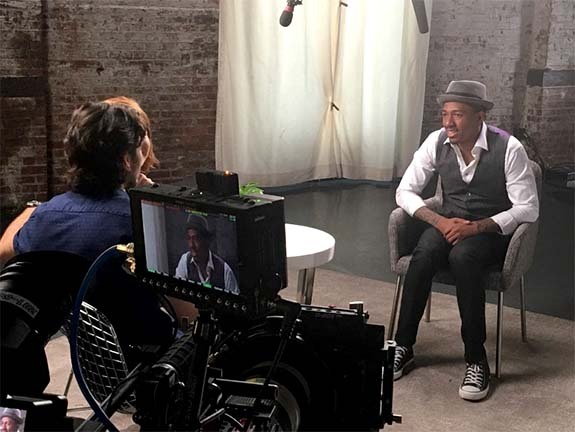 Nick Cannon, the host of America's Got Talent and Wild 'N Out, explores modern love — and diamonds — in the newly released "docu-short" titled Why Real Is Rare. 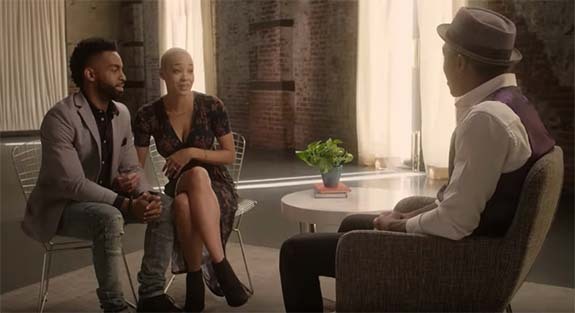 Tapped by the Diamond Producers Association (DPA) to study relationships and help unlock the magic and mystery behind finding "the real thing," Cannon looks into the lives of six couples to reveal new truths about human connection and commitment in the modern age. 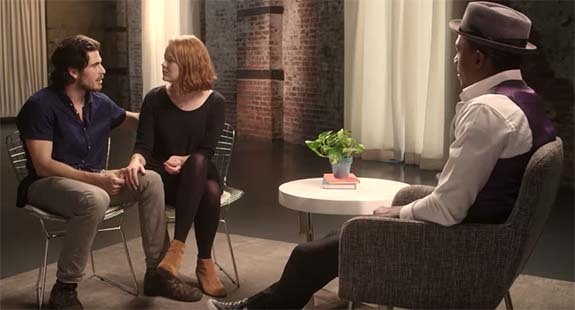 "We share stories about the standout moments... that shaped their relationships, the challenges they've faced, and their unique take on why their commitment is the real deal," said Cannon. "Everyone loves in a different way, but they were all searching for something more genuine, and they found it in each other." The "docu-short," which runs 3:18, can be seen on the "Real Is a Diamond" YouTube channel as well as the DPA website. It's part of a new integrated campaign, which marks are dramatic departure from traditional diamond marketing. The campaign invites consumers to take a fresh look at diamonds as an ideal symbol of authentic, meaningful connection and commitment. "Real is Rare. Real is a Diamond" is the diamond industry's first category campaign in almost a decade. "This campaign explores the delta between being connected and having a connection," said Deborah Marquardt, Chief Marketing Officer of the DPA. "It's common today to have hundreds, if not thousands, of connections. People are 'connected' online 24/7 but the ability to find someone special and have a genuine emotional, physical and spiritual connection with them feels more rare than ever before. The moments when couples realize 'this is it' are as precious and individual as a diamond itself." Credits: Screen captures via YouTube.com; Photo source: Diamond Producers Association. 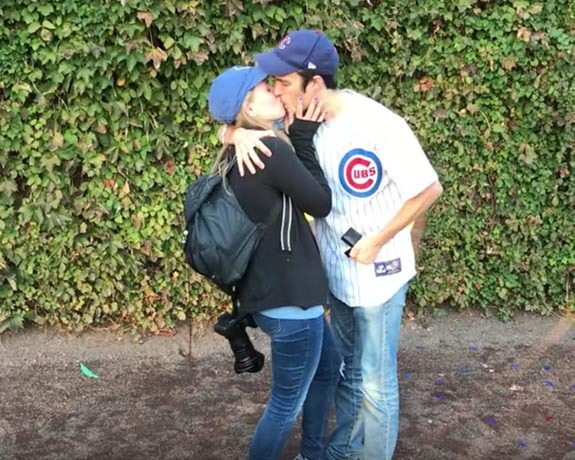 With the Chicago Cubs winning the World Series for the first time in 108 years, die-hard fans Christopher Lenard and girlfriend Lindsay Fuhs did something that no other couple has ever done before — get engaged in front of the iconic ivy-covered wall at Wrigley Field while holding the World Series trophy. It happened on Friday as five million elated Cubs fans from all over the city celebrated the end of "The Curse," the longest World Series drought in Major League Baseball history. 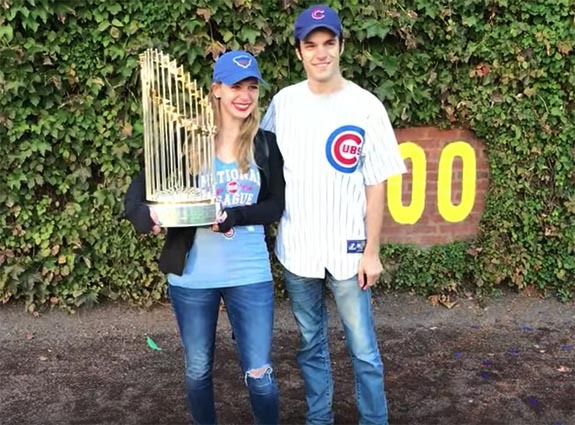 The young couple was invited to take part in the World Series Trophy photo op thanks to Fuhs' connections with the team. Her dad, Rick, is a scoreboard operating and groundskeeper, who has worked for the franchise for 38 years. The couple also has close ties to Wrigley Field. This is where the couple first dated, and Fuhs worked as an usher at Wrigley for two years when she was in high school. 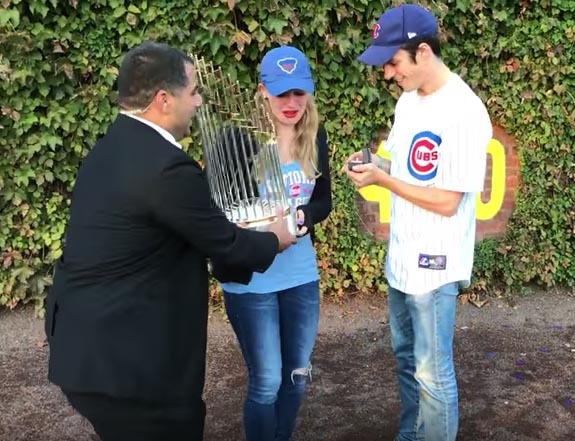 The Commissioner’s Trophy was brought to Wrigley Field so team employees and loved ones could enjoy a once-in-a-lifetime opportunity to pose with the once-elusive trophy. In a video posted to YouTube, we can see the happy couple as they stand in front of the ivy in centerfield. Fuhs is wearing a broad smile, Cubs cap and Cubs National League Champions t-shirt while carefully holding the trophy. 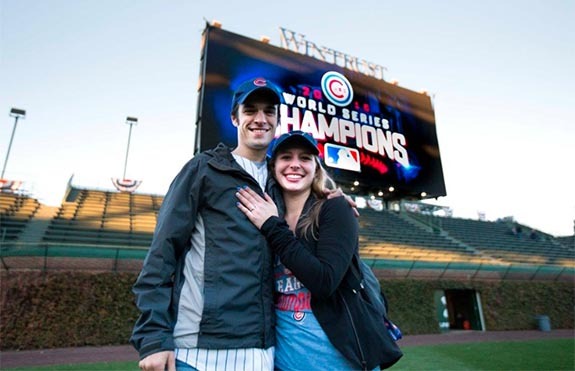 Her boyfriend — decked out in a Cubs jersey and Cubs cap — is standing proudly at her side. Nobody is aware that he has a surprise hidden in the front-left pocket of his jeans. After the official photos are taken, Fuhs calls for one more shot and aims her gaze at a second photographer. Lenard calls for one more shot, as well, but it's for a different reason. At that moment, Lenard pulls the ring box from his pocket, gets down on one knee and proposes to his startled girlfriend. "Oh, my God," Fuhs gasps. "Will you marry me?" asks Lenard. To free up her left hand, which is locked onto the precious trophy, a member of the Cubs promotion team steps in to assist. Fuhs turns her attention to her fiancé and new diamond engagement ring. The couple kisses, embraces and basks in the glory of a Cubs World Series win and the prospects of an exciting life together. Fuhs documented her monumental day with more than 100 photos on Facebook. The couple's story has gone viral, with stories on USAToday.com, MLB.com, ESPN.com, Chicago Sun Times, Yahoo Sports and 63,000 views on YouTube.com. 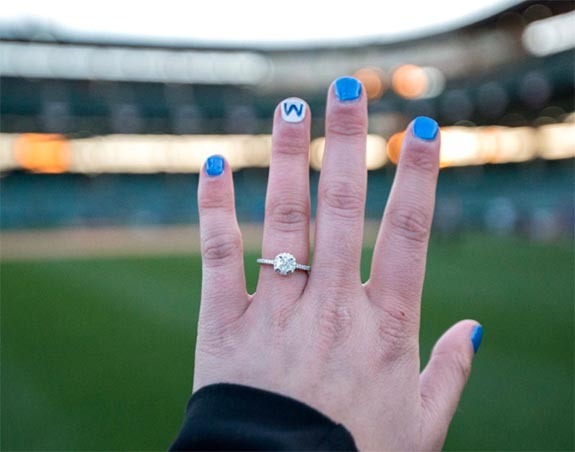 The "W" on the nail of her ring finger resembles the famous "Win" flag, which Cubs fans fly as a symbol of their dedication to the team. 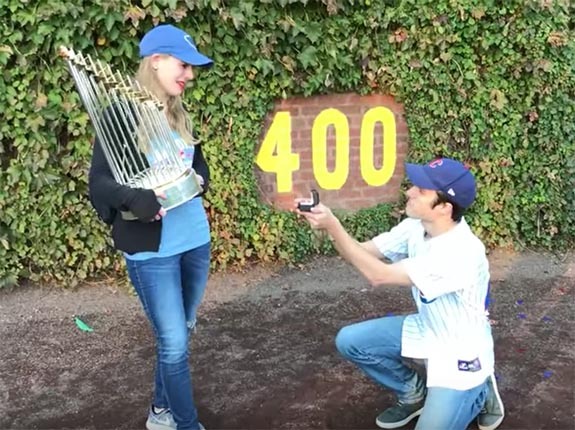 In explaining his motivation for popping the question at Wrigley Field, Lenard wrote on YouTube.com, "The Cubs won for the first time in 108 years and I decided to do something literally no one has ever done before." Credits: Screen captures via YouTube.com; Photos via Facebook/Lindsay.Fuhs.